Sophomore Brooke Blackburn overlooking the scenic view of rural Orvieto, Italy. Midterms, for most, are the only thing stopping students from sleeping in their own beds for a week straight. For the students studying abroad in Italy, midterms mark the halfway point in their semester and the barrier between them and traveling across Europe for a week. From March 1 through March 10 of the 2019 Spring semester, many students went back home to rest, others went on various Spring Break Alternative Service Trips, while some lucky few got to venture even farther through the world. The 43 study abroad students in Orvieto Italy were all at a prime location to travel throughout Europe for their Spring Break. The foreign cities these Saint Anselm students traversed stretched across Europe including Prague, Vienna, Budapest, Amsterdam, Dublin, Paris, and Barcelona. It seems even more cruel for students studying abroad to return back to a mundane routine of schoolwork and grocery shopping than normally returning from their hometown to the Hilltop in New Hampshire. It may shock many to know that the return to Orvieto was not as dreaded as one might think. Orvieto is characteristically a quiet uneventful Italian town, much different from the huge exciting cities that many travelled to over break. Yet, the charming and homey nature of Orvieto is what has captured the hearts of the students that are studying there from Saint A’s. The students in Orvieto Spring 2019 will likely all attest that they were more than excited to see the Duomo Cathedral in the distance over the hills. The massive Cathedral can be seen from far away on the final train ride from Rome to Orvieto. The Duomo is Orvieto’s greatest landmark and greets students as they arrive back to their home away from home. Each person has his or her own opinion on what makes something meaningful to them. So, to sum up what makes Orvieto so enticing and comforting to students would take more space than can be allowed in a single article. For most, the appeal of Orvieto has been found in its friendly nature. Everywhere you look down the streets family and friends converse in café’s and gelaterias. No dog is ever out of shape or lonely. For every stroll you take down the street, you can be sure to see at least one dog being walked. The food is always fresh and never fast. A favorite of many students is a tiny pizzeria place across from Orvieto’s town hall which will give you a warm slice of pizza for only one euro. Perfect for a budget and a hungry stomach. Students from Saint Anselm studying abroad have begun to feel like they are part of a community again. 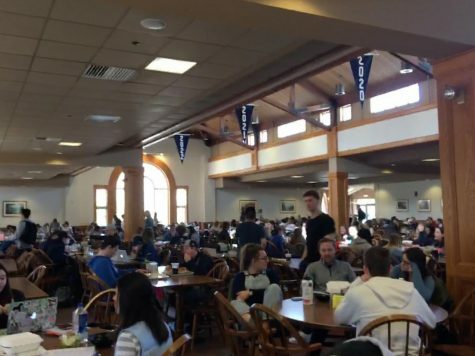 Coming from a campus like Saint Anselm that focuses so much on the comradery of student life and building a large community, it was hard for many to leave the relationships they had built and be left out of many activities on campus. Yet, most have found that Orvieto truly is a mirror hilltop to Saint Anselm. Every resident in Orvieto has a place, including the students. 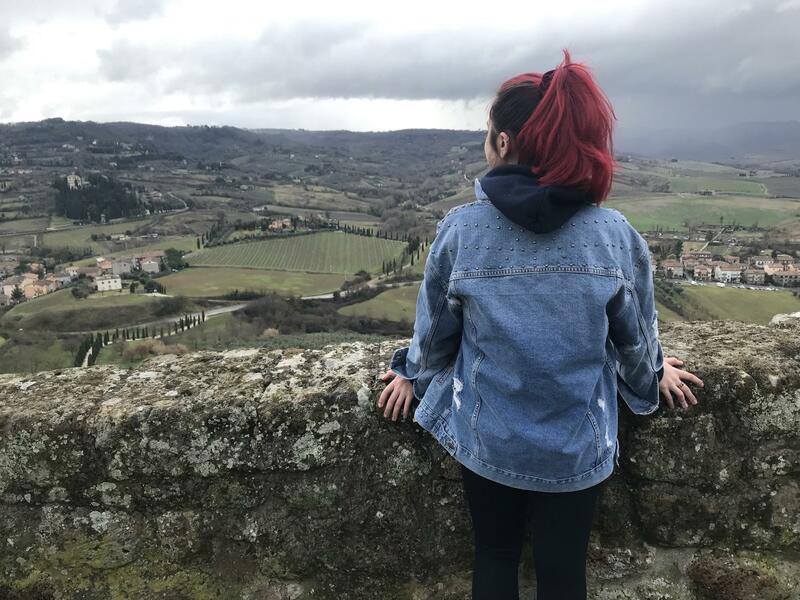 Kait Brine, Junior Peace and Justice major expresses her joy at returning back Orvieto after traveling for spring break and seeing faces she has grown accustomed to in Orvieto. Every student has found a place and a new pastime that they look forward too. At Saint Anselm, a student might have been counting the days back until the next CABingo, while here students look forward to the live bands playing at Montanucci’s Café on the city’s main street, Corso Cavour. Students are reminded of the bells of the Abbey on campus when they hear the powerful, melodious chimes of the Duomo’s bells. For those who might miss the many club meetings and student activities on campus, Orvieto has a bustling street market every Thursday and Saturday. The market’s prime motive is to sell fresh fruits, vegetables and flowers from local growers, and often some thrifted clothes and shoes. However, the market is also a place where friends and family from the town all go in the early morning to catch up, much like club activities. Dennis Aveta, Junior International Relations major and veteran of the Orvieto Summer dig in 2018 explains how this is one of his favorite parts of living in Orvieto. From bakers, to dog-walkers, florists, children and study abroad students, everyone has a place in Orvieto. The 43 students studying in Italy from Saint Anselm have found their own little spot across the Atlantic. Day by day they find new shortcuts to class and look a little less awkward ordering their morning cappuccino. Of course, many remember the days of trying to find their way around campus freshman year, but soon enough students always find a place to call their own. Orvieto has become a sanctuary and a pleasure for everyone who has been studying here for this Spring 2019 semester. The days are going by faster as students pass the halfway point of their semester, already expecting to be forever changed by the small city in Italy they called home for three months.